(WBIR) The National Parks Service awarded Big South Fork National River and Recreation Area, along with three horse clubs, as the joint-recipients of a restoration grant. The grant, one of many Centennial Challenge Grants, will install better road access to Appaloosa Field, which is one of only two fields in the entire park where large groups are allowed to camp or hold special events. Four-star event rider Hilda Donahue has her sights set on the World Equestrian Games, but not in eventing. Instead of galloping four miles over fences, she wants to trot 100 miles in the endurance competition. 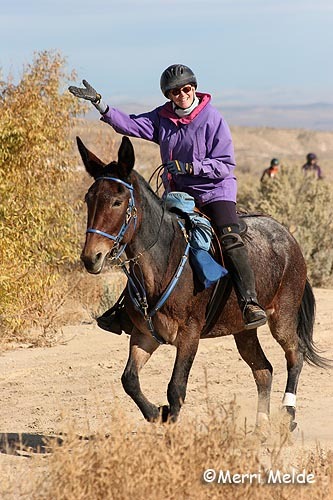 Hilda got her start competing in endurance because her husband and sisters-in-law are avid endurance riders. She joined her family on her first ride one year ago and hasn’t looked back. In fact, she has finished in the top ten in all four FEI rides she’s completed so far and is currently fifth on the FEI World rankings. As an eventer, Hilda was short listed for the Irish World Equestrian Games team in 2002 and rode in the World Cup final at Pau the same year. She’s competed in all but two of the world’s four-star events (missing Luhmühlen and Badminton), and is a familiar face in Area III, always sporting a sun hat and a friendly smile. So adding to her list of goals, which includes competing at Grand Prix dressage (she’s currently at Prix St. George) and completing the two four-stars missing from her eventing record, Hilda wants to ride at the prestigious 100-mile Tevis Cup this August and eventually qualify to ride for Ireland in endurance at the 2016 World Equestrian Games. As might be expected, Arabians and part-Arabians were by far the largest percentage of breeds competing in US endurance riding in 2014. Pure-bred Arabians made up 61.94%, while half-Arabians and Arabian crosses were 16.65% of the total. The Mustang is the second-most pure breed in the sport, making up 1.74%. Exhibiting the variance of mounts in endurance, one might run into some rare breeds on the trails, including Colorado Ranger, Mangalarga Marchador, Blazer, Florida Cracker Horse, Gypsy Vanner, McCurdy Plantation Horse, Moyle, Oldenburg, and Spotted Mountain Horse. Thanks to Mike Maul for compiling and sharing it! Ann Marie Barnett and her steed MM Woodrow won the 41st running of the American River Classic Endurance Ride Saturday. In addition to having the fastest overall time, the pair won Best Condition accolades, the Barceleau Cup for being the first horse that completes the 50 mile ride in the Pioneer Division and demonstrating the “willingness and ability to go on,” and who carried a minimum of 165 pounds with tack. Second place honors went to Brandon Reed aboard Foxy and third to Kamal Shehadeh and Java, both of Granite Bay. 1) Explain how the sport of equestrian has helped you reach your goals so far. 2) Explain how you plan to continue your involvement in equestrian sport during college. 3) Explain your future career goals after college. Click here https://www.usef.org/documents/HighSchoolAthlete/HighSchoolScholarship_Application.pdf to apply. Please email tschroeder@usef.org for more information about this scholarship. Aurora, Colo. - The Arabian Horse Association (AHA) is excited to announce that they are officially naming May, 2015, 'Celebration of the Arabian Horse Month.' This is a time for Arabian horse enthusiasts to share in their communities the wonderful, intelligent and beautiful Arabian breed. AHA encourages members, clubs and regions to host at least one outreach event during the month of May in their area. Designed as a grassroots marketing initiative, Arabian Horse Month encourages local members and clubs, who have the best access to people in their area, to reach out to all walks of life and introduce them to the magic of the Arabian horse. To do this, AHA has created an outreach toolkit full of wonderful ideas and initiatives that clubs and regions have done in previous years or are planning to do this year that can be considered outreach and marketing initiatives for the Arabian breed. These include ideas and activities such as participating in a youth therapy program, an after school program that barns can do, events that members can host at a show, holiday ideas, and so much more! The outreach toolkit also includes information on how to give a successful TAIL tour, becoming a Discovery Farm, social media tips and ideas for generating new membership! During May, AHA will support member’s outreach initiatives by providing promotional material (at just the cost of shipping) for giving out for FREE at the event. Jutta Schmidt, Minot resident and 32-year veteran healthcare worker at Trinity Hospital, is leading a clinic April 25 to introduce North Dakotans to the sport of endurance horseback riding. Even though this sport is at least 50 years old in the U.S., Schmidt says it is relatively unknown in North Dakota. She, and an avid group of other practitioners, mostly women, intend to change that. 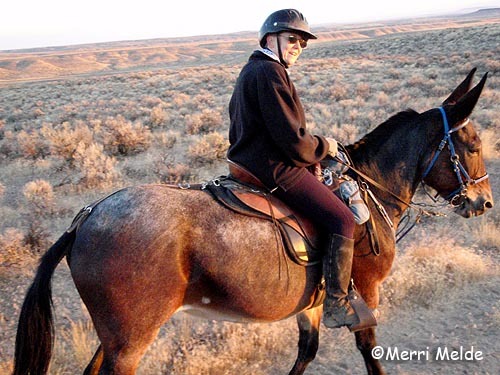 Endurance riding as a sport is somewhere between trail riding and the Kentucky Derby. There is competition to win each race, but for most, endurance horseback competitions are more akin to a marathon race for humans, where anyone who participates and finishes has a sense of accomplishment and bragging rights. With endurance horseback riding, the emphasis is on the horse, not the rider. Although there are awards and prizes, their mantra is "to finish is to win." These events begin with distances of 25-30 miles and increase to 100 miles and more. Your horse has to be fit to continue at all times, including on the other side of the finish line. Washington, D.C. - The Time to Ride Challenge, offering $100,000 in cash and prizes, has signed up over 400 participants since opening for registration March 1st. Motivated by a desire to grow their businesses while reinvigorating the horse industry, providers have signed on to host beginnerfriendly events between May 30-September 30. The top 10 hosts in three divisions that reach the most newcomers will win cash prizes up to $10,000. The Challenge encourages Hosts to provide a variety of fun, beginner-friendly horse experiences. In 2014, the most popular activity offered by Hosts was meeting/petting a horse (84%), followed by riding, grooming, and educational activities. Golden Ridge Stables of Lakeville, MN found huge success with their event on National Night Out, “a well known national event held the first Tuesday in August encouraging neighbors to get to know each other. We offered pony rides on our school horses, a hay ride shuttle to and from a nearby neighborhood, hands-on grooming demonstrations, and fun games like learning to rope, egg and spoon on foot, horseshoes and musical hay bales,” reported owner Ann Hoffman. “This event was a big success for us because it increased our visibility in the community and helped us foster good relations with nearby neighborhoods. We have several new housing developments being built near us so we're trying to capitalize on the building boom by increasing awareness of our lesson program. The goal was to meet new people and we definitely did that!” Hoffman and Golden Ridge Stables were awarded first prize in the “Best Practices” Contest, an additional incentive within the Challenge that rewarded Hosts for sharing their innovative event ideas. The plane bucked and twisted as I clutched the arm rests, refusing to look out the window at the canyons below. My skin was pale and sticky as I tried my best not to hurl up the Mexican fiesta I’d downed at the Salt Lake City airport. I was on a 20-seater plane headed to Moab and regretting my decision to not just take the few hours to drive myself to the middle of Utah’s desert region. The ginger-bearded guy next to me smirked. I glanced at the inked sleeves – roses, checkered flags, skulls – that danced across his weathered forearms. He was wearing a faded Jack Daniels tee and I caught a whiff of stale liquor. I clenched the arm rests tighter and tried harder not to hurl. “Doesn’t look like you’re headed to Moab for the Jeep festival,” he said, eyeing me up and down. “I’m going to ride horses,” I said. It sounds weird, but I hate explaining what I do to people who don’t ‘get’ horses. If I say I’m going to ride a horse they think I’m a jockey, or a cowgirl. It’s even more complicated now if people pry and I have to try to explain to them I’m training to race 1,000 kilometres across Mongolia. Thankfully the ghost of his ex-wife dead-ended our conversation and I could focus back on avoiding barfing. When the plane finally bounced onto the tarmac 20 minutes later, I was the first one down the stairs and on solid ground. Stepping outside the one-room Moab airport was like climbing into one of those hot air hand dryers. The wind was strong and the sun baked cracks in the red earth. A tumbleweed skittered by. In the distance snow capped mountain peaks rose up above the red rock and desolate flatlands littered with sagebrush. The nausea was receding and it was my turn to smirk. In that second, I knew I’d found my training grounds for Mongolia. The Forest Service intends to implement a “Supervisor Closure Order” for 200 miles of historic trails located in the East End of the Mount Rogers National Recreation Area in southwest Virgina. 1. Eliminate the “Supervisor Closure Order” from the Forest Service plan. 2. Preserve the current 200 miles of historic trails they intend to close in the East End of the MRNRA. The “Supervisor Closure Order” would result in tickets and fines for citizens riding on any part of the forest not designated as an official trail. "Not only will this action restrict our personal freedoms, it will have a negative impact on the economy at all levels, on the environment, and on the health and wellness of the very citizens that make our country strong," the Coalition says. The Time to Ride Challenge returns in 2015 as a grassroots campaign to grow the horse industry by introducing new enthusiasts to horse activities. The Challenge, taking place May 30 to Sept. 30, offers a unique opportunity for horse professionals to grow their business while competing for $100,000 in cash and prizes. In 2014, its inaugural year, the Challenge provided more than 25,000 people with first-time horse experiences through 702 beginner-friendly Time to Ride Hosts in 49 states. Registration for the Challenge at www.timetoridechallenge.com and is open to stables, clubs, veterinarians, feed stores, businesses, and organizations dedicated to welcoming newcomers to horse activities. "Hosts" are organized into Small, Medium, and Large divisions and are encouraged to be creative in providing fun, safe, and educational horse events that encourage attendees to become further involved in horse activities. The Hosts who provide the greatest number of newcomers an introductory horse experience, as calculated by contact information collected, will win awards. A post-Challenge survey in 2014 found that 92% of the 25,281 newcomers who attended a Time to Ride event said they wanted to participate in more horse activities. Canadian Len Crow wanted to help fund orphanages, so he decided to ride horseback from Alaska to Mexico. Six times. 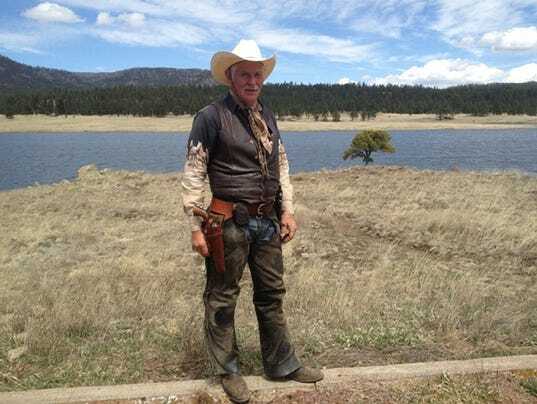 For the last 10 months, neither snow nor rain nor heat nor torn rotator cuff has stayed rancher and pastor Len Crow from his goal: to ride 6,800 miles on horseback from the edge of the Arctic Ocean to Guadalajara, Mexico. This is Crow's sixth such "endurance" horseback ride for charity. The 61-year-old Canadian is using the trip to raise money to build five orphanages, one each in Cambodia, Guatemala, India, Mexico and the Philippines. Crow began his journey on June 6, 2014, departing from — of all places — Deadhorse, Alaska. He'll admit it was not the most auspiciously named starting point, but the map left him no choice. "I wanted to go as far north in North America as I could by road," Crow said. "That was as far as I could get. We chose that as our beginning point." In an effort to expand AERC's trail advocacy reach, the committee has created a Trails Email Forum for AERC members. The forum is for members interested in all things trails to share trail story’s, ideas, experiences, advice, and general brain storming. This forum will stay positive and constructive. Please contact Monica Chapman AERC Trails Committee Chair to join the list. For more information on the AERC Trails committee visit the AERC.org website. Back Country Horsemen of America protects our right to ride horses on public lands in a wide variety of ways across the country. They believe in putting a priority on the things that really matter, such as making our beautiful landscape accessible to all users and developing partnerships that help us accomplish that. BCH folks know there’s value in lending a hand, even on projects that don’t directly benefit horse users. Sometimes building relationships means pitching in even if you have to leave your horses at home. The Uinta Basin Chapter of Back Country Horsemen of Utah have been looking for ways to get involved with trail work in Dinosaur National Monument. This National Park Service property along the Colorado and Utah border consists of 210,000 acres of river canyons, mountains, and basins that support over a thousand different native species of plants and animals. The Utah side also boasts dinosaur fossils and the world renowned Carnegie Fossil Quarry. Although horseback riding is not yet allowed in Dinosaur National Monument, the Uinta Basin Chapter BCH contacted the land managers to offer their assistance with trail maintenance. Because of Back Country Horsemen of America’s reputation, they were told a face-to-face meeting was not necessary and were asked to help with work on a hiking trail. Uinta Chapter Back Country Horsemen members met with hikers, youth volunteers, and NPS em­ployees to build rock cairns and a rock stair step on the busy Sound of Silence hiking trail. After a long work day, BCH members discussed with the land managers the possibility of a horse trail in Dinosaur National Monument and were invited to meet formally for further discussion. Lending a hand where it’s needed, regardless of personal interests, builds a rapport that benefits everyone. The Uinta Basin Chapter of Back Country Horsemen of Utah will continue nurturing this relationship, making a way for us to enjoy this stunning landscape by horseback. Back Country Horsemen of America values our country’s past and welcomes opportunities to preserve it. Managers of the Salmon-Challis National Forest recently began restoration of the Norton Ridge Lookout in the Frank Church River of No Return Wilderness. This abandoned cabin sits on an open mountaintop at nearly 8500 feet elevation. Constructed by the Civilian Conservation Corps in 1933 to house fire spotters, it is eligible to be listed on the National Register of Historic Places. The Treasure Valley Chapter of Back Country Horsemen of Idaho eagerly participated in the project which was carried out under the super­vision of Archaeologist John Rose from the Challis office of the Salmon-Challis National Forest. Their purpose was to begin the restoration work necessary to maintain the cabin’s historical value and for the use and enjoyment of the structure by the US Forest Service and the public. Treasure Valley Chapter BCH’s first task was to pack in wood shingles to be stored inside the cabin for re-roof­ing at a future date. They trucked their horses and equipment seven hours to the trailhead at Meyer’s Cove. From there, they rode and led their pack animals 14 miles along Camas Creek to the spot where it flows into the Middle Fork of the Salmon River. The next day the group rode 11 miles upstream along the Middle Fork River to the Sim­plot Ranch and airstrip, where the shingles were delivered by plane. At this point, it was learned that the 11 mile trail from the airstrip to the cabin had not been cleared. Most of the TVBCH group spent four days clearing the trail and packing the shingles up to the cabin. It took another two days to pack out to the trailhead and return home. Despite the long trip and various challenges, the Treasure Valley Chapter of Back Country Horsemen enjoyed taking part in an important historic project. With just over 17 weeks till the 60th annual Tevis Cup on August 1, entries are available here. The $400.00 fee includes drug testing, Robie Park camping, and one ticket to the Sunday Awards Banquet. Complete pages 1-4 of the application. Award buckle is $160.00 when reserved pre-ride and is nonrefundable. Buckles are $250 when purchased post ride. Due to low inventory of donated buckles from riders who have previously completed the Tevis, the Legacy Buckle Program will not be offered for 2015. We sincerely hope that the program can be reinstituted in future years when our “recycled” buckle inventory is sufficient to support the demand for this highly successful and much appreciated program. Signature ride entries are available for $1500, and include a traditional ride entry plus a generous donation to the Western States Trail Foundation. The entry package includes a buckle upon completion of the ride, a commissioned print by Chuck Centers specially created for the WSTF which is shown on the signature entry form, an invitation for 2 to the VIP/Foreign Rider dinner, 2 tickets to the Wednesday evening barbecue, 2 tickets to the Robie Park Friday night dinner, reserved seating and 2 tickets to the Sunday Awards Banquet, 4 nights of stabling for your horse, and additional items. The Signature Rider also receives CalStar helicopter insurance for a year, parking assistance at the Robie Park ride camp and Foresthill vet check.